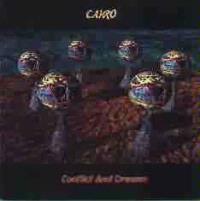 Conflict and Dreams is the second album by San Francisco based progressive rock band Cairo , and was nearly two years in the making. The influences apparent on this album read like a who`s who of progressive rock, including UK, Yes, ELP and Genesis. The personnel on this album are Mark Robertson, Jeff Brockman, Alec Fuhrman, Bret Douglas and Jamie Brown. This is classic progressive rock, with some modern twists. The vocals on this album are strong and rather unique, (powerful and good tonal quality). Feeling much like a harder edged UK, this song seems to address the two sides that are present in every one and the constant struggle these sides are in with one another. "Opposing views defy all trace of reason". This song contains some wonderful bass work, and at times some Wakemanesque keyboard work. This is definitely quite a nice track overall, and works as an excellent introduction to the album. This song is about a man struggling with the inner demons and pain of his past. The song is a struggle to get his life back from these personal demons. He toys with the idea of death, but finds the strength in himself to find his way back to life. The track takes on hope as he begins to see a way to self-determination, and a path back to his dreams. Musically, this one is very much in a Genesis sort of vein, but includes a very nice Yes influenced section. Some of the keyboard work on this one is very Rick Wakeman influenced. The ending of this song, both lyrically and musically, is very powerful and triumphant. This is a very dynamic song, starting with some heavily UK influenced music. Lyrically, this one is a sort of picture of an Egyptian desert scene. "Legends of the pharaohs and their kingdoms are due, Glories of old now struggle with the, Clash of conflicting views in a troubled age". Shortly after the UK based intro there is a section which is very much in the vein of Steve Howe`s song writing style, and leads into some very high-energy instrumental interplay. This section includes some very heavily ELP influenced work. The next changes lean towards Genesis, then back to UK, then back to Genesis again. This song is a wonderfully mixed progressive bag of tricks. This is a nice instrumental track, actually an intricate piano solo. Image is a very likable piece. This song, another strong entry, once again combines UK influences with Steve Howe influenced guitar work. The ELP influences are also strong on this song, which relates the tale of a man looking for a woman from his dreams, but she is always just out of his grasp. "Follow your steps-search all the world just to find you, Then you were gone". This is another wondrous progressive excursion, influenced primarily by Yes and ELP. The lyrical content of this song reflects upon the loss of dreams brought on by the harsh realities of war. In the beginning of the song "For this land I will fight, For my King I would walk the valley of the shadow". However, by the end of this song, alienation and disillusionment has set in. "Dreams I`ve been fighting for, striving for, dying for, Dreams I`ve been fighting for, living for, don`t shine anymore". This is a very pleasing piece and serves as an appropriate closer to a fine progressive rock album.